In the museum we continually receive postgraduate and masters’ degree students, doing internships. Today, we have invited David Fernández to explain his research experience, almost like a detective, which has allowed the puzzle of fragments, corresponding to four doors from different places around the city, to be reconstructed. When Jordi Casanovas proposed this project to us as a work for my internship, I saw it straight away as a major challenge. 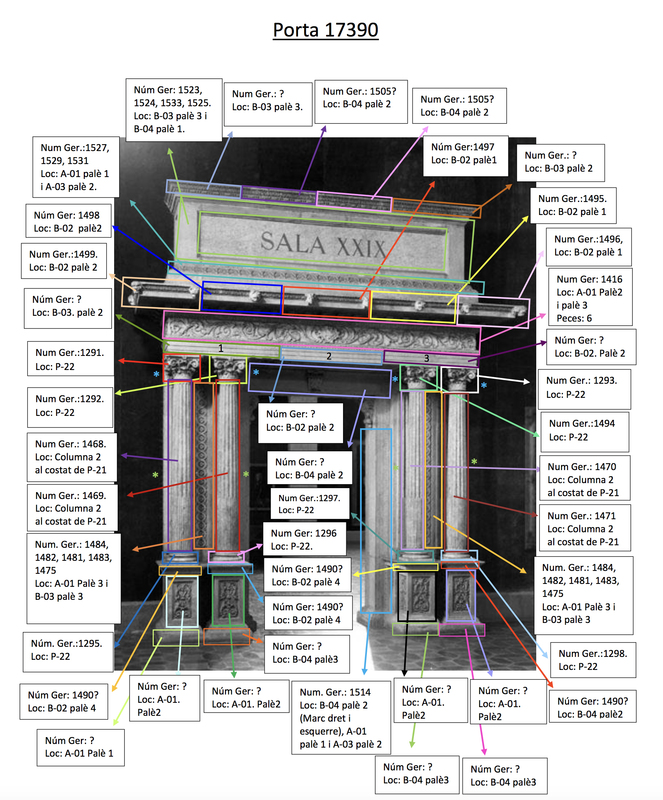 It was a question of localising, based on some photographs, four stone doorways that arrived in the museum when the Palau Nacional became a museum. 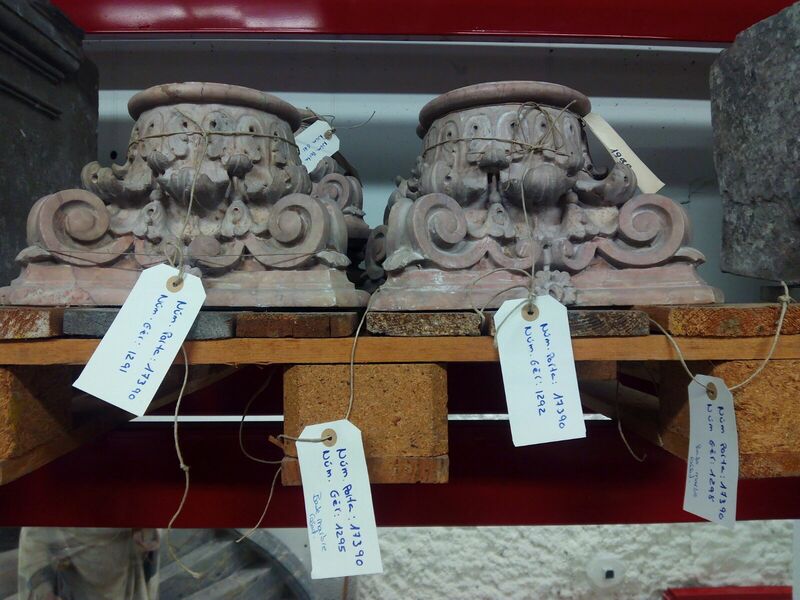 These had been used within the museography as doors to provide access to the different galleries. 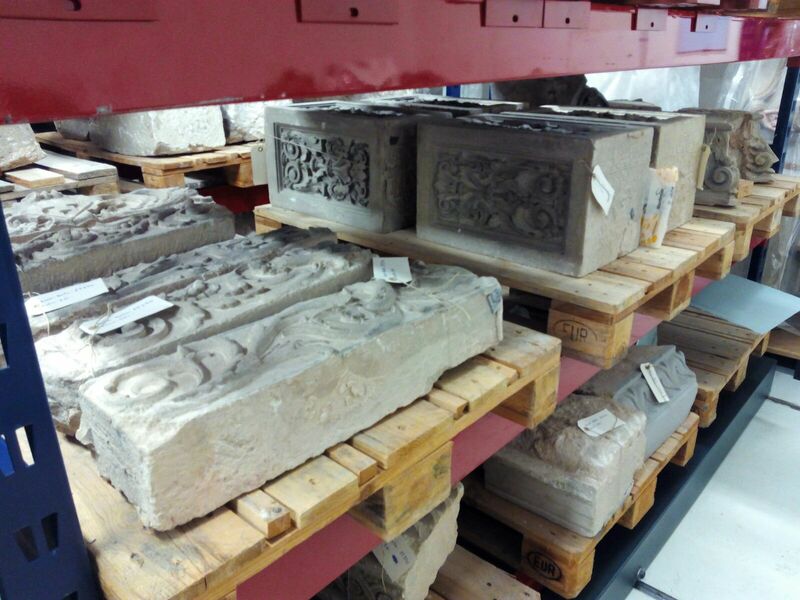 But with the subsequent remodelling, they were dismantled and were deposited in a scattered way around the storagerooms, without leaving exact proof of the specific positions of the different fragments. 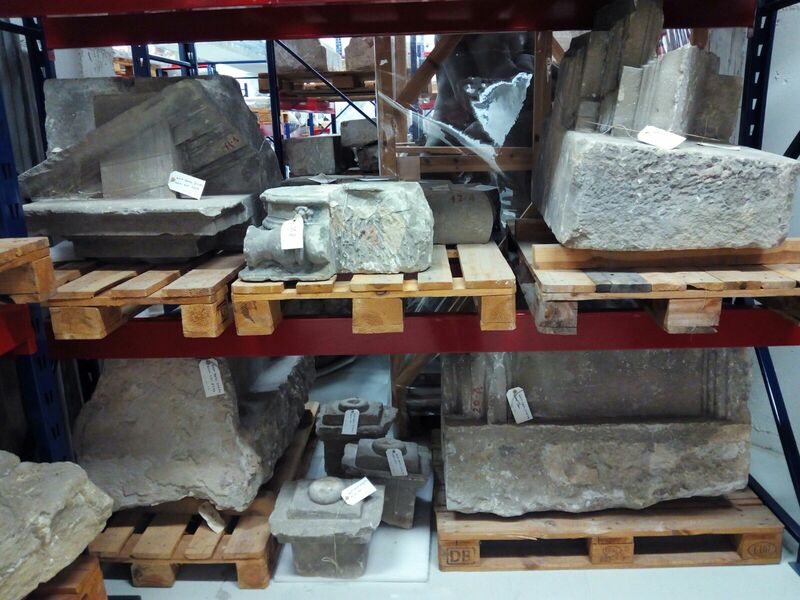 In 1991 and 1992 Géraldine Mallet carried out an inventory when the move took place of the more than 1,500 pieces from the old stone storeroom to the current location (the storerooms RS2 and RS3 of stone and plaster). My first task consisted of digitising this inventory so as to be able to facilitate in this way the subsequent search for the parts of the doorways within the storeroom. It was on completing this process when I realised that some of the record cards of the pieces from the lapidary collection had, instead of an inventory number, another number called the “red dismantling number”. This made me wonder if there could be some relation between the pieces that had this numbering. I created a document trying to group together the different pieces of this inventory, according to the possible relations that there could be between them, based on the numbers that had been assigned when they were dismantled. It was therefore a constant process of deduction: all those pieces that ended with a number and a letter, a number and a number, or a number and a symbol, could have a relation between them. 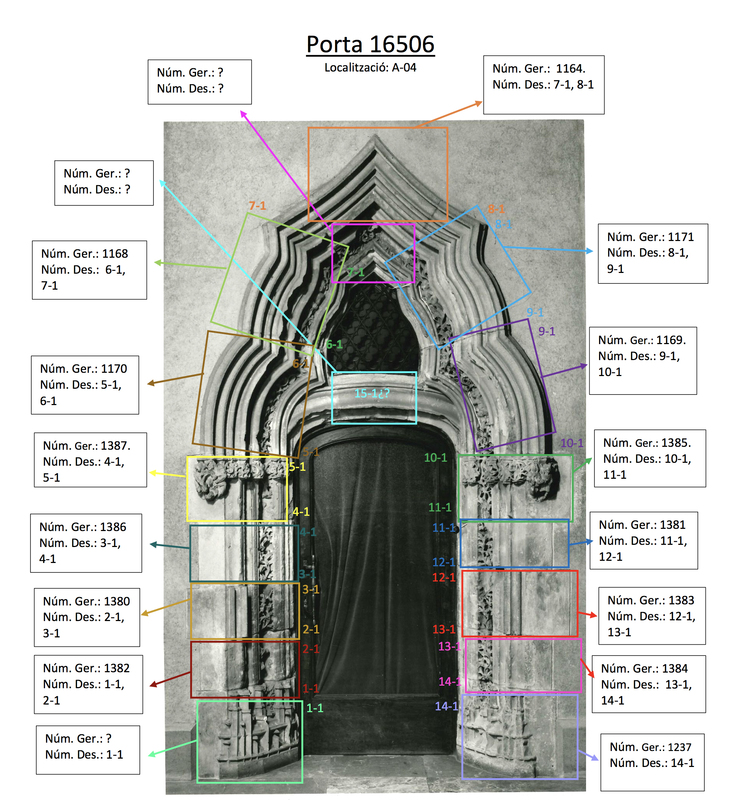 Based on the initial photographs, we began to create the record cards of the different doors in which, subsequently, both the different parts of these, as well as all the information which was obtained and discovered, would be introduced and marked down. 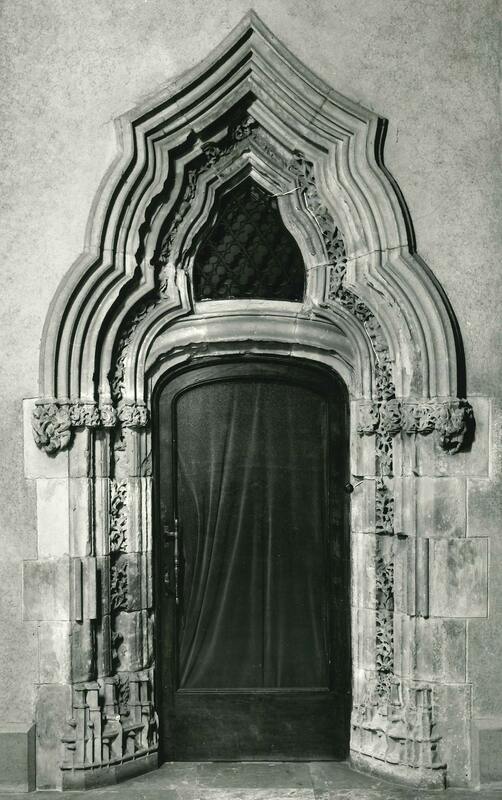 The first doorway which we started with was a door from the 15th century, by an anonymous author and unknown provenance. It was during the process of localisation of this first doorway, when I confirmed the relation between the dismantling numbers. I deduced, based on some record cards of the inventory, that all the parts should end in X-1. Therefore, I consulted the document that had been produced beforehand, where the pieces that had a dismantling number were classified, and selected all the pieces that had a number ending in “1”. I only needed to go down to the storeroom and finish localising the pieces that weren’t included in the inventory. Luckily, in the case of this door, they could all be found in the same area. 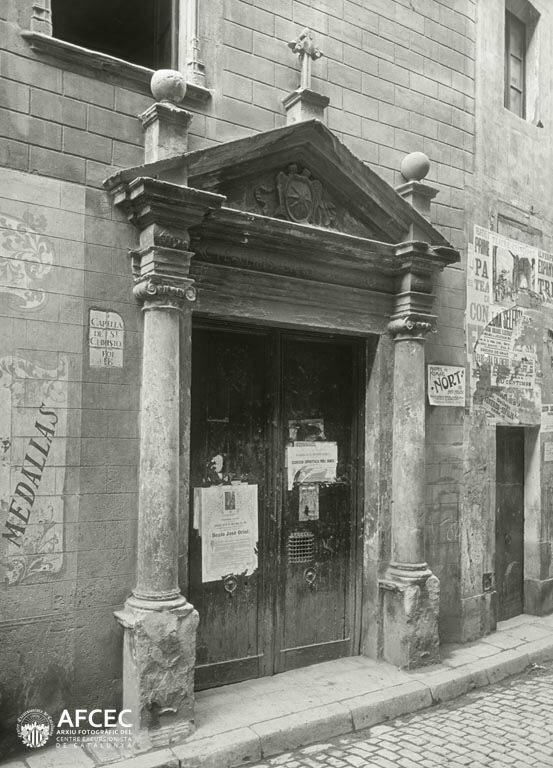 The second door to be localised was a Renaissance doorway of the destroyed chapel dedicated to Sant Cristòfol, which was situated in the street of Alt de Sant Pere of Barcelona. With this door the same process was carried out as with the previous one. But, in this case, the characters that were assigned in the dismantling of the doorway were a number accompanied by the letter “A” (X-A). And the direction of the attribution of the dismantling number was from right to left and from bottom to top. 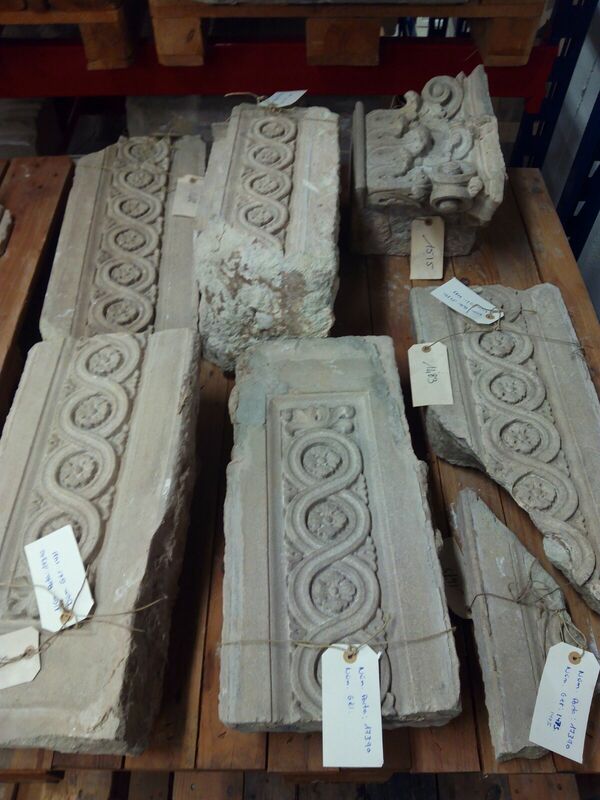 Furthermore, on this occasion the parts of the doorway were found to be more scattered around the storeroom than in the previous case, something which meant it was necessary to check the storage sections, stone by stone, to be able to find the parts. At the moment, we have only missed the three spheres of the crown. 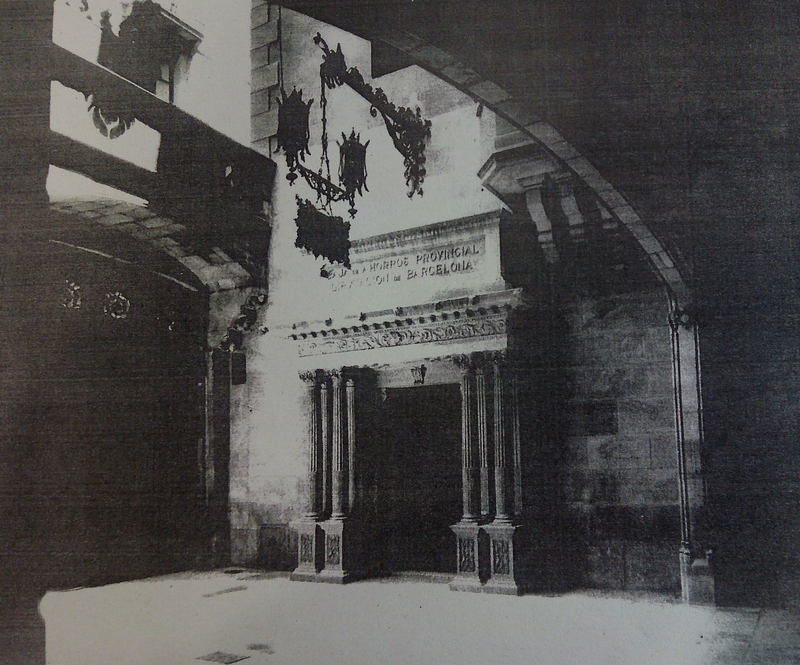 The third doorway located was the frame of a door imitating the Renaissance style, from the old Caixa d’Estalvis (Savings Bank) of the Diputació de Barcelona (Barcelona Provincial Council) which was situated in the Palau de la Generalitat itself, and was designed by the architect Joan Rubió i Bellver. 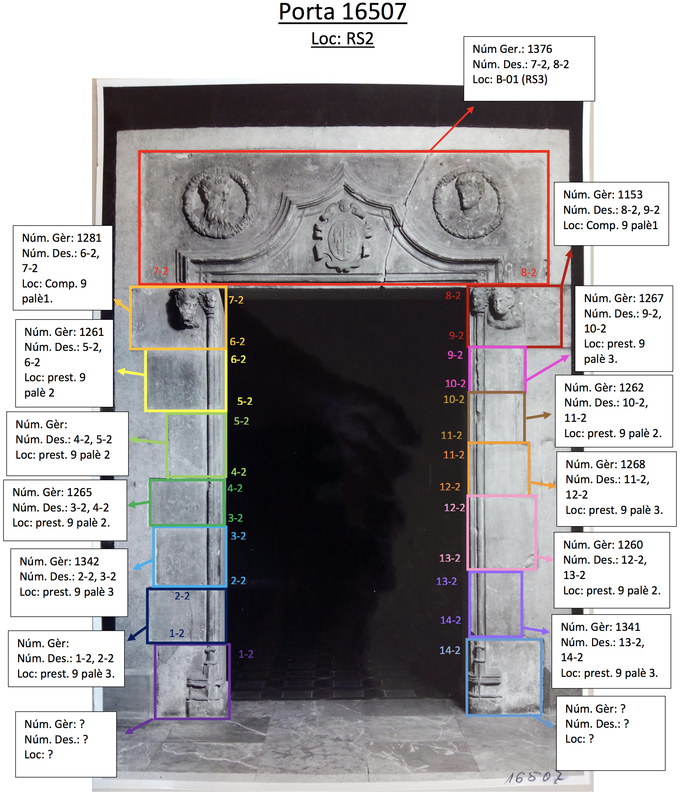 In this case a major obstacle appeared: during the dismantling of the doorway no number had been assigned, which implied that it was necessary to go down to the storeroom from the first moment to check what the pieces were that made up the doorway and to see where they could be located. But once in the storeroom, another unforeseen thing emerged: the door had been highly fragmented and scattered throughout the storeroom, without any type of order. This made the localisation, identification and subsequent deduction of its collocation on the doorway difficult. The pieces that could form part were searched for in the different sections, and groups were made depending on the similarities with the different parts of these. 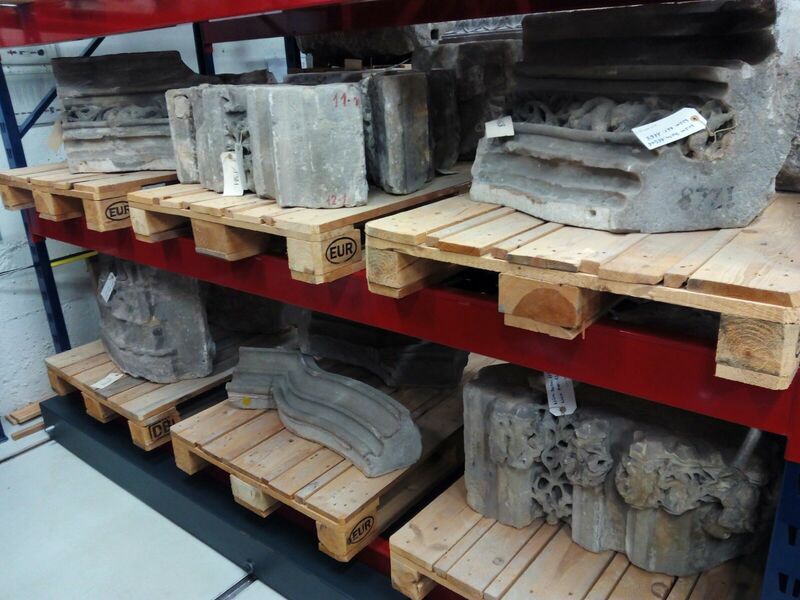 Sections of the storeroom RS3 with fragments of the doorway of the old Caixa d’Estalvis of the Diputació de Barcelona. 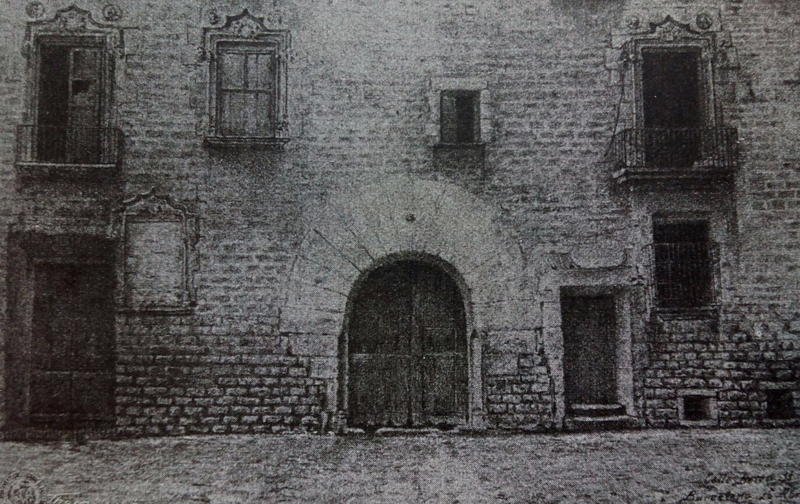 And the last doorway, which in reality is a window, from the old house of Serrallonga, located in the disappeared street of “Baseya” number 31 de Barcelona, demolished in 1909 due to the works of Via Laietana. In relation to the localisation process, it should be said that the first piece of the door of which information was recorded, was the lintel, since this was the only fragment that was included in the lapidary inventory of the museum. As it also had a dismantling number, this facilitated the search for the rest of the pieces, as it meant that they would also have one, and at the same time this would allow us to discover their position within the doorway. Even so, we haven’t been able to find the two bases of the doorway. 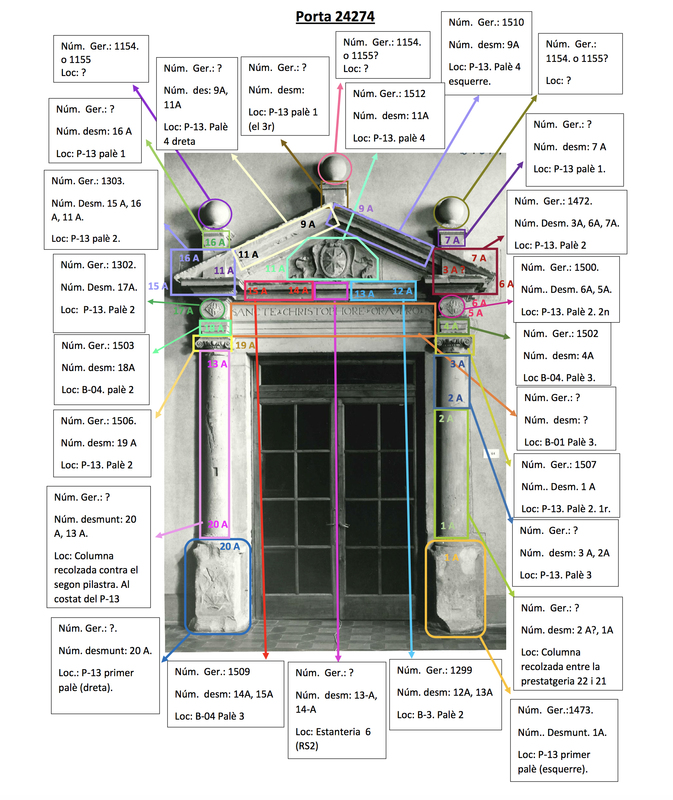 Finally, once the parts of the different doorways had been identified, located and introduced into the record cards of the management programme of the museum collections, labels were created for each of them. 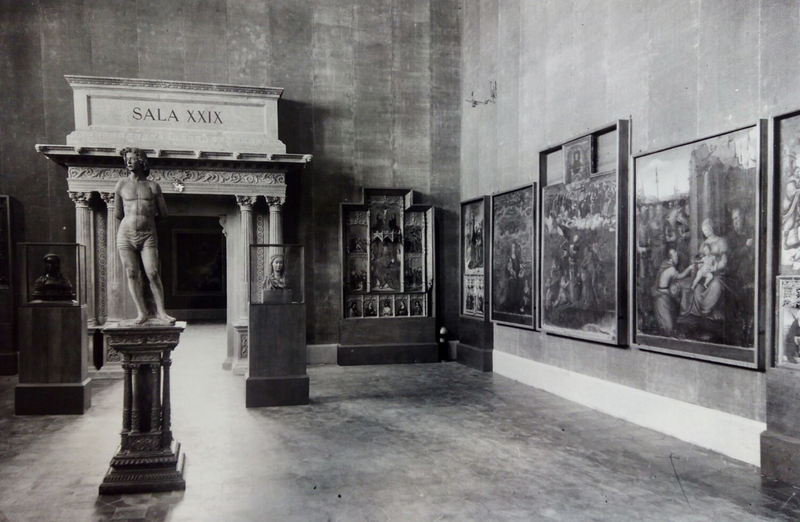 The inventory number of the doorway assigned by the museum was also included – the number established by Géraldine when she created the initial inventory of the lapidary collection and the dismantling number.